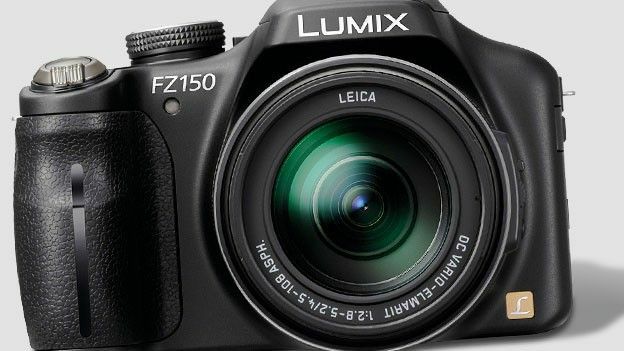 A flagship super zoom joins the Panasonic FZ line up. So what does the FZ150 offer to justify being priced similar to an entry level DSLR? When you've used a camera with a large zoom lens bolted on the front, going back to a pocket model with a weedy 5x or even 7x lens can feel like trying to take a picture with one arm cut off. Closely resembling the feature set of the FZ48 model, and styled like a miniature digital SLR, the FZ150 – updating the FZ100 – likewise fields a 24x optical zoom, starting out at a wide angle 25mm equivalent, running up to 600mm at the telephoto end, and boasting grandly named Black Box Nano Surface Coating technology to minimise lens surface reflections. We also get, as expected, Full HD 1920x1080 pixels video clips at 25fps (even its semi-pro G series interchangeable lens models are yet to stretch to 30fps) into the bargain, and a slot-on lens shield is provided in the box to minimise sun glare in bright conditions. It's worth pointing out that, unlike a DSLR, the FZ150's lens cannot be swapped however. But then again, an equivalent lens on a DSLR would be both prohibitively bulky and expensive, so with the FZ150 you're getting greater portability, if not quite as sharp image quality. As with the FZ48 camera we recently reviewed, the new FZ150 goes up against the slightly higher-powered likes of the Fujifilm Finepix HS20, Canon PowerShot SX30 IS, Olympus SP-810UZ and Nikon Coolpix P500, to name just a few competitors in its 'super zoom' category. Like the best of them the Panasonic incorporates stereo microphones just behind the lens barrel and incorporated within the housing up for the pop up flash, though stills resolution is again a modest 12.1 megapixels. Its maker has obviously thought 12 is more than enough for the consumer market and crowding a small-ish sensor with more pixels will only lead to more visible grain if shooting at top ISO3200 light sensitivity setting. It's a sensible if hardly dynamic choice. Hitting the shops this month (October 2011), suggested retail price for the Panasonic Lumix DMC-FZ150 is £469.99, so £120 pricier than its almost carbon copy in the existing £349.99 FZ48. Let's take a look at how its manufacturer might justify this extra expense. Like its FZ series forebears this camera is chunky, which on the upside means a large and comfortable handgrip, with enough space between it and the lens barrel to prevent your knuckles chaffing against it. As well as a decent grip the camera benefits from optical image stabilisation to help counter-balance camera shake when shooting towards the extremities of the zoom. Feeling a little plastic-y to the touch, dimensions are 124.3x81.7x95.2mm, so the FZ150 won't fit in a pocket. Weight is a reassuring 528g with rechargeable battery and SD card inserted, lending it that built-to-last quality. The shutter release button that sits on top of the handgrip is large, obvious and springy, and is ergonomically encircled by a lever for operating the zoom; so in practical terms it's easy to zoom in and fire a shot without having to take your eye off your subject. Alternatively a second, larger zoom lever is provided on the lens barrel, should you wish to zoom with your left hand and press the shutter with your right. A busy shooting mode dial contains 14 options, including intelligent Auto, which 'recognises' common subjects and implements the best settings for you, allowing for pure point and shoot operation, as well as the usual smattering of pre-optimised portrait and landscape modes. This being a Panasonic we also get a Creative Control setting, which allows the picture to be tweaked in camera. Choose the 'Expressive' option within this setting to boost the intensity of colour for example, which can work really well. In summary there is the option here to use the FZ150 as a glorified snapshot, albeit one with a huge lens and so wide array of framing options, or get more 'hands on' and customise its features as you desire. The FZ150 differs from the FZ48 in that, happily, it features an angle adjustable 3-inch LCD screen, which can be flipped out parallel to the body as you would with a palm camcorder. Furthermore the screen can be flipped or twisted so that the 460k-dot resolution LCD is facing the body for added protection when inactive. While this is a boon for composition and certainly worth having for low and high angle photography, it's a moot point as to whether it's worth £100+ more than the fixed screen on the FZ48 alone. Directly above the LCD is a smaller, lower resolution 201.6k dot electronic viewfinder (EVF) that juts out, but not far enough that your nose doesn't squash up against the screen below when you bring an eye level with it. Although useful on models with a fixed LCD, we felt the larger angle adjustable screen here made the EVF slightly superfluous. A button is provided for switching between use of the EVF and LCD: an eye sensor for doing this automatically would have been even better. But as we say the LCD is so flexible the EVF here is even more secondary to use of the FZ150. Though we'd have preferred Panasonic to have located an on/off lever surrounding the shooting mode dial, like on its GH2 model, whereby the camera might have been activated with a flick of the thumb, instead a simple power switch sits to the far right of the top plate. A finger flick of said button and the FZ150 is ready for your first photo or video in two seconds. Should users desire, the camera is capable of up to 12 frames per second (fps) continuous stills capture, and impressively at full resolution too, up from the 3.7 fps of the FZ48. Also a boon for sports photography is 220fps high-speed video, which provides slow motion results. Even in normal single shot mode the camera is fast, locking onto target in an instant, but officially 0.1 seconds. Otherwise the camera responds fluidly to each button press and menu selection, the lens barrel adjusting from maximum wide angle to extreme telephoto in all of four seconds if you hold a finger down on its zoom lever. Fortunately the full extent of the optical zoom can be used for video as well as stills. The Panasonic Lumix DMC-FZ150 comes supplied with a chunky DMW-BMB9E rechargeable lithium ion battery, with mains charger and plug provided in the box. This is good for approximately 410 pictures from a single charge, so marginally better then the FZ48 that uses the exact same cell, according to industry testers CIPA. The ability to eek out power over roughly a week's occasional use means that this is a good option for a jack-of-all-trades camera to take on holiday with you, should an autumn or Christmas break be planned. We sometimes find regular stills from Panasonic cameras to be a little flat, so the ability to occasionally add a sense of dynamism with the Creative Control modes, indicated by the artist's palette on the shooting mode dial, is welcome. Here we enjoyed the ability to swap between retro (slight yellowish tint), high key (high contrast), pinhole (Box Brownie type shaded edges), and the now ubiquitous miniature effect, being able to see what effect they would have before we fully squeezed the shutter release. Like most digital cameras that are, at their heart, point and shoot snapshots, it's best to stick at ISO800 or below to avoid image noise, and though we did occasionally get soft shots shooting at maximum zoom, the image stabilisation feature means that there's a higher chance of getting usable results with it switched on than without. As we noted earlier, the zoom can be used when shooting video, though the built-in mics do inevitably pick up the sound of the lens barrelling through its focal range, with an audible 'clunk' as it comes to a stop. This will be less noticeable in busier environments. Though a dedicated video record button commences shooting automatically, a manual or 'creative' video mode found on the top dial also lets users adjust exposure and colour for video shooting – so if you've wanted to shoot a black and white epic, this could be the camera for you. The FZ150 is a good option for anyone looking for the one camera that does it all. Though it is not particularly cheap or portable, you're not going to be considering this bridge camera – so called because it forms a 'bridge' between the simplicity of use of a compact and the relative complexity of a digital SLR – unless a large lens takes priority over everything else anyway. If you're not bothered about a tilting LCD screen or faster shooting speeds for action photography though, save yourself £120 and go for the FZ48.